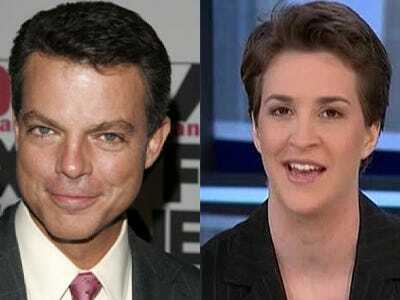 Aw, does Shep Smith go home at night and watch Rachel Maddow (or Jay Leno)? Could be! Have you looked at the list of the top 10 donors to political campaigns? Seven of those 10 donate to Republicans. The other three that remain of those top 10, they all donate to Democrats and they are all unions. This sounded familiar to the sharp-eyed folks at Johnny Dollar who noted that Rachel Maddow said almost the exact same thing on her Tuesday appearance on Leno, and the previous Friday on her own show. RACHEL MADDOW: If you look at the last election cycle, of the top 10 people donating money in that election, seven of them were giving to Republicans, those were all corporate interests and Right-wing PACs and stuff. Seven of the 10 were all Right-wing, and the only three that weren’t were unions. So, if Republicans can get rid of the unions, particularly these public sector unions, they can run the table in every election from here on out. Now it is no secret that Maddow is a fan of Shep, and it wouldn’t be terribly surprising if Shep was a fan of Maddow. But you have to love the idea that Shep, one of Fox’s biggest stars, may be getting tipped to stuff by Rachel Maddow. They should do a road show! Side note: There was some agonizing over at Newsbusters about whether Maddow has her facts straight (she hasn’t of late) but the end conclusion is yes, she does….and subsequently so does Shep!